Seems that BART went out of ser­vice tonight. I was walk­ing towards the Trans­bay Termnial when I saw a long line going all the way out of it. You can tell that they need­ed tick­ets or some­thing of that sort. Thank God I didn’t for­get my pass today or I would’ve total­ly been there all night. It’s weird though… I guess they all didn’t have any change to pay the fare—in the bus. It just goes to show that every­one don’t car­ry cash any­more. Any­ways, BART is all about safe­ty. Though it caused a lot of peo­ple some grief and delays on their way home, we just got­ta be glad that there are oth­er ways out to the East Bay. (03–29) 18:55 PST SAN FRANCISCO — BART ser­vice is resum­ing after a near­ly 90-minute shut­down caused by a com­put­er net­work­ing prob­lem. BART stopped reg­u­lar ser­vice after the prob­lem hit at 5:27 p.m., mov­ing all trains under man­u­al con­trol to the near­est sta­tion. Sys­tem offi­cials said trains had resumed about 6:50 p.m.
BART spokesman Lin­ton John­son said the prob­lem was dif­fer­ent from the soft­ware glitch that plagued the sys­tem Tues­day, but had the same effect — a ser­vice shut­down. 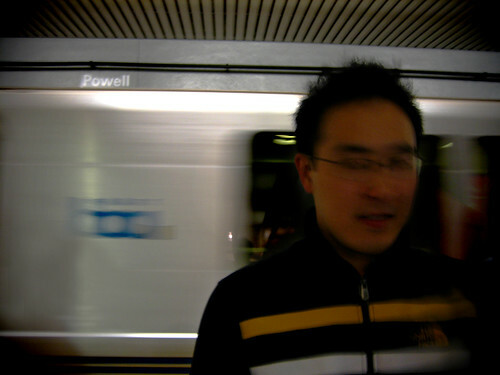 Since the day he was born about a quar­ter plus years ago in SF, Justin has nev­er used the BART. Today, was a glo­ri­ous rainy day—as he final­ly expe­ri­enced his first BART ride. Even though it was a short one (from Mont­gomery Street to Pow­ell street), it was well worth the $1.40 in change spent. Please do know that this was a joke. Come on, its like not going to Dis­ney­land for free and liv­ing a mile away from it. You are currently browsing the Just a Memo archives for the month of March, 2006.